One of the activities we do in every Camp Millionaire and Moving Out! for Teens program is simply called Financial Habits. It’s great for an adult financial education program as well as many adults just don’t understand the importance of establishing great financial habits. Important financial habits everyone might want to learn. Before the program, draw a T on a large piece of flip chart paper. 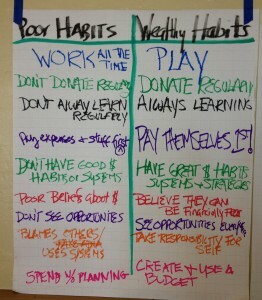 Write “Poor Habits” on the left (it’s important that it be on the left*). Hang it on the wall in front of the group where everyone can watch this sheet start to fill up with information. As the program goes along, simply fill in the left and right sides of the chart, being sure to go over them at the end of the day as a review. NOTE: notice that we use a different color for each new habits. DO NOT use just one color as it just blends into one great big page of words no one sees. It’s easy to look at almost any money management habit and see both sides in terms of behavior. The more habits you can illustrate on the chart, the better and if you need to start a second sheet, by all means do it. Remember, one of the most important things you can do to help your students (any age) learn is to illustrate the information. This simple activity done throughout your programs can make the difference between your students remembering the information or not. What habits will YOU write on YOUR sheet? Final Note: It’s always best to have a sheet pre-written on your instructor table where you will see it often as the program goes by. This way you can add any habits that you miss while you’re in the process of teaching. * In neural-linguistic programming, the past, or where you’re going FROM, is generally illustrated on the left and the future, or where you’re going to, is generally illustrated on the right. For example…if you’re telling a story to a group of people in order to illustrate moving from an unwanted state (emotion, situation, etc.) to the desired state, you usually start telling the story from the audience’s left (your right), which is their past and move across the space to the audience’s right (your left) which is their future.